Kask helmets are a familiar name these days, the Italian brand having sponsored Team Sky since their inception. The Dieci sits towards the top end of their range with a hefty price tag to match, and prioritises fit and comfort over all-out light weight. In contrast to most other top-end helmets, the Dieci is only available in a single size. This is made possible by Kask's highly adjustable 'Up-N-Down' retention system, which uses a hinged cradle to provide a massive amount of vertical adjustability in addition to the usual dial for tightening it up. Being able to position the retention system down low on the back of the head makes for a much more secure-feeling helmet. Indeed, the Dieci blows most of the competition away in this respect. Despite being made from quite chunky plastic (which is less likely to break in a crash) the system has just enough flex to conform to the shape of the head which, coupled with the inclusion of some textured padding, makes it very comfortable. Comfort is obviously a big priority, as Kask have chosen to spec plenty of proper foam pads inside the helmet itself, whereas more overtly lightweight helmets often compromise in this area. Speaking of weight, our Dieci weighs in at a porky 318g (38g heavier than advertised), but carries that weight well by virtue of the excellent retention system. Some may baulk at this number, especially considering the Dieci's £130 price tag, but those who prioritise fit and safety should be well served. If weight is a key consideration, then some of Kask's other race lids, such as the Vertigo, would be a better option. The only real downside to the excellent system is that it can interfere with some sunglasses as the hinge sits quite close to the back of the ear. This can be overcome with a bit of fiddling, but whatever you do, there will likely be some overlap, so you'll have to either place the arms over the retention system or under it. In practise, this was only a minor issue and easily resolved with a few minor adjustments. Construction wise, the Dieci is your typical in-moulded helmet, and features 19 air vents. Ventilation is on par with other racing helmets in this price bracket, but not exceptional. For UK conditions, it does the job. One aspect of the vents that could have been improved has nothing at all to do with ventilation, but rather, to the ease with which one can store sunglasses in them. Due to the Dieci's vent layout, I found that I had to position my sunglasses at an angle to get them into a secure position – not conducive to that all-important pro look. A quick glance over the Kask website and the promotional material associated with their helmets leaves you in no doubt that they are proud of their Italian heritage. The Dieci itself features a little 'Italy Made' label on one of the straps while the retention dial is painted with the Italian flag. Whether a consequence of the location of manufacture or not, the quality on construction is something that does shine through – the plastic shell to foam interface is very neat and tidy despite plenty of use over a number of months. Representative of Kask's attention to detail and focus on comfort is the inclusion of a leatherette chin strap instead of just using the microfiber strap material. This not only improves comfort, but also make is quick and easy to clean after a particularly sweaty ride. I tend to ride with the chin strap quite loose on most helmets, but found I was comfortable wearing this leatherette strap much closer to the skin, no doubt increasing safety in case of a crash. In keeping with the Dieci's one size fits all design, the strap is long and there's plenty of room for adjustment. Top end racing helmet with an excellent retention system that prioritises fit and comfort over light weight. The quality of construction and the inclusion of neat details such as a leatherette chin strap go some way to justify the high price. Excellent. The quality of the finishing is very neat. The retention system does a great job of providing a secure and comfortable fit. Weight and ventilation could be better. The Up-N-Down retention system provides all the adjustment one could possibly need whilst still being comfortable. The inclusion of proper Coolmax helmet pads is a nice touch. On the expensive size considering its heavy weight. 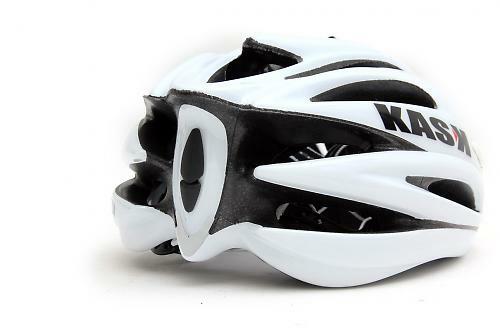 Its standout feature - the retention system - is available on cheaper options from Kask, such as the K50. Difficult to get sunglasses to sit level in the vents. Love this helmet. Best I've owned, and I chunk through them at a fair pace (vanity, not inability to throw myself against objects head first). I got the matt black version meant for MTB and removed the visor. Mmmm...matt black. I also have this (2012 version). I have a massive napper and this fits perfectly. I can also borrow it to friends safe in the knowledge it will fit. The quick closure system is excellent and it has good breathability. Bit heavier than some models but feels absolutely solid, and I know what's most important to me between safety and weight. This was the first thing I bought, even before I bought a bike, and probably the most expensive item I bought aside from the bike in the first year. I've just got a Mojito and the 'up down' thing is awesome. Really comfortable and makes adjustment for wearing skull caps/thicker winter hats underneath a doddle. If it's one size fits all, surely it would look like a Mariokart mushroom on a smaller head? 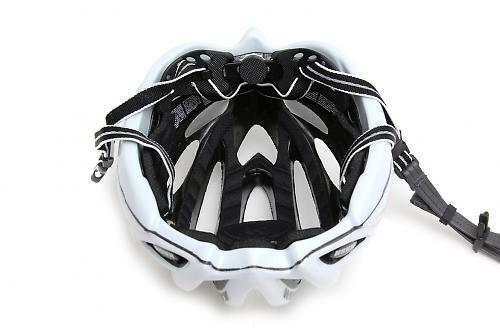 Oh, and why do all cycling helmets have a rear that could be the back end of a spacecraft in a sci-fi plot? !